Note to self: Back up site. Second note to self: Keep things up to date. Right-o. So I’m working to put everything back together here. The daunting project is going to be getting all the Puppet art into some sort of sane order. My mind boggles every time I open the folder on my computer. BOGGLES. It’s hard to believe there’s a single Puzzle Pirates player in the past five… no wait, seven! years that doesn’t have a Perilous Puppetar. I have hundreds of these things. It’s intimidating to try to think of sensible ways to organize and display them. By year? By character? By hat? Who knows! The pattern has been revised to incorporate more textured stitches so it lies flat (yay!) without lots of obnoxious blocking. Have I mentioned that I adore seed stitch? I ADORE seed stitch. You know what’s better than seed stitch? 100% angora seed stitch. Feel the halo! Share the post "Scrub, scrub, scrub. 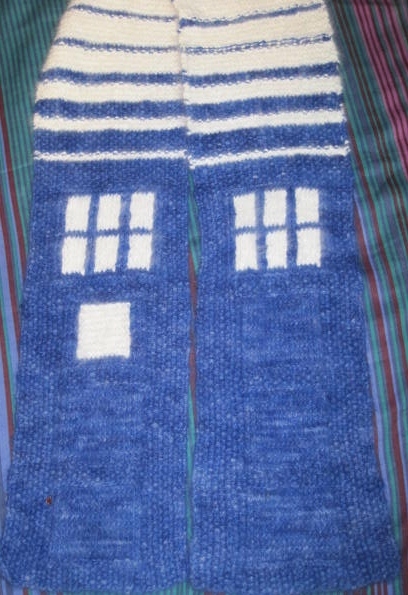 Also, TARDIS Scarf pattern." 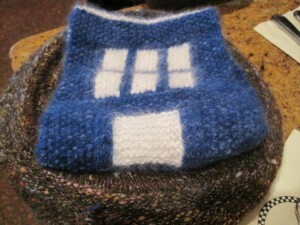 This entry was posted in Knitting, Website Shenanigans and tagged Doctor Who, Pattern, TARDIS. Bookmark the permalink. One Response to Scrub, scrub, scrub. Also, TARDIS Scarf pattern. It is very cute Tilinka, I think I may have to take up knitting again so I can make that for a friend of mine.